It is particularly healthy and effective procedure. Teeth are cleaned of staining, naturally bleached and restored with the specific hydroxyapatite formula (nHAp™). Whitening removes deeply seated stains with orally safe detergents and remineralizes and repairs enamel with nano-hydroxyapatite using an active oxygen foam. CrWR nHAp™ treatment Cleans, re-Whitens and Repairs teeth, while reducing sensitivity with nHAp™ tubule penetration. PrevDent® utilizes a scalable system of hydrogen peroxide and nHAp™, allowing a highly oxygenated foam application with your choice of whitening results. nHAp™ remineralizes enamel and dramatically reduces hypersensitivity, so the procedure can be performed on patients with increased tooth sensitivity. PrevDent® CrWR procedure is safe, effective and painless. 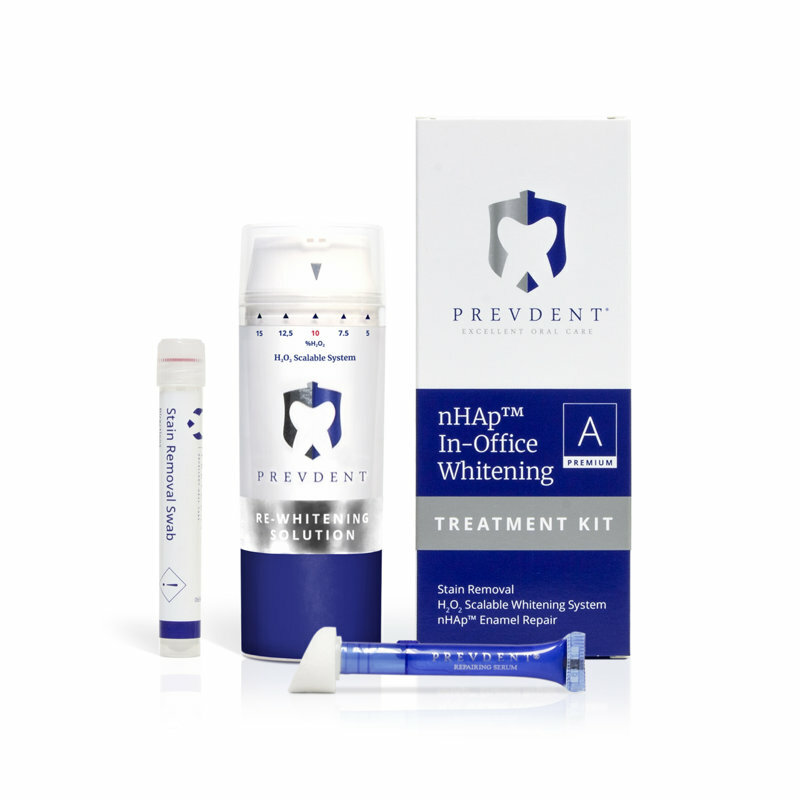 PrevDent professional makes your teeth whiter in average 9 shades in about 2 hours. Carry out a professional dental hygiene a week before the procedure. Is there an advantage for teeth whitening with a lamp? The bleaching lamp used in the PrevDent® CrWR procedure produces warmth in the mouth (about 39C). It activates the effects of the active substances and greatly accelerates the course of the procedure. Patients do not have toothache or sensitivity during and after the PrevDent® CrWR procedure. Patients with naturally very sensitive teeth may experience low sensitivity after treatment. For this purpose, PrevDent® nHAp™ toothpaste with nano-hydroxyapatite is recommended after treatment. It significantly reduces sensitivity and restores enamel. C - Cleaning - The Stain Removal Swab contains advanced detergents and orally safe solvents to remove deeply seated stains and clean the tooth surface prior to each application of the Re-Whitening Solution. rW - Re-Whitening - The two part Re-Whitening Solution brightens teeth using Hydrogen peroxide and nano-Hydroxyapatite that is delivered to teeth in thick tooth adherent foam. The advanced foam decreases the surface tension of the tooth, allowing the solution to penetrate enamel and restore teeth to their natural white color. R - Repair - The Repairing serum PrevDent nHAp™ repairs and remineralizes the teeth using concentrated nano-Hydroxyapatite after the Re-Whitening Solution application. The Repairing serum helps to naturally seal the tooth surface to prevent sensitivity and new stains from forming.